You know how there are some things which just take you back... to another place, another time, perhaps even another love? Well one of those songs for me, is Me &Mrs Jones. Now I know that's a strange choice for a woman, as it's basically about a man who is in love with another man's wife, but it's more about the slow, smooth tempo of the song, and how the melody seems to get right into my heart, than about the lyrics. That's why I was so excited to discover that the legendary Roy G. Hemmings, [formerly of The Drifters] is performing at the Birmingham REP theatre on the 14th July. He's running a fabulous line-up of songs, including Love Train, My Girl and loads of others you will instantly recognise. I know I'll be there in the audience, toe-tapping and singing along, will you? Honestly, it's the strangest feeling. People often ask if I am proud when I release a new book. Well for the parents amongst you, do you remember the first time you took your child out in public? How you wanted to show him or her to the whole world, yet also protect them from any harm the big bad world might represent? You do? Well that's exactly how I feel today. So if you see me out and about today - please be gentle! Press Release as featured in newspapers. Worcestershire author Carmen Capuano is about to make a bit of a stir this month, with the release of her latest novel, Ascension, which she describes as a cross between The Hunger Games and The Da Vinci Code. “Ascension will make a lot of people uncomfortable. 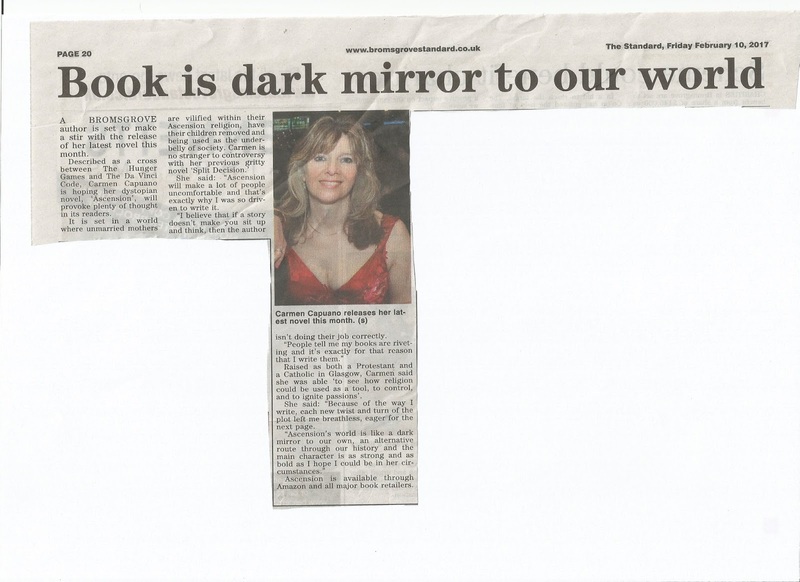 It’s certainly not a book for the faint hearted – and that’s exactly why I was so driven to write it,” says Capuano. And it’s not the author’s first foray into uncomfortable territory. Split Decision which was published previously, caused a small furore when it came out, for its gritty content. Now, under even bigger publishers, Capuano hopes to earn more acclaim for this newest offering. Set in a dystopian world where unmarried mothers are vilified within their Ascension religion, having their children removed and being used as the under-belly of society, the story is fast-paced and gripping. Ascension is available through Amazon and all major book retailers. Thanks to the Bromsgrove Standard.